The library trifecta is - physical book, audiobook, e- book. If I have all three for a book- I am golden. I can listen to it while I go through my day, I can read it at night, and I can take it anywhere I want to on my Kindle. So thanks to the trifecta, I have finally read this much loved book and I definitely understand some of the hype...but not all of it. Summary from goodreads.com : Beyond the smoke and mirrors, however, a fierce competition is under way--a contest between two young illusionists, Celia and Marco, who have been trained since childhood to compete in a "game" to which they have been irrevocably bound by their mercurial masters. Unbeknownst to the players, this is a game in which only one can be left standing, and the circus is but the stage for a remarkable battle of imagination and will. I don't especially like fantasy- which this book is firmly in. I think I'm particularly susceptible to the "world building" stage of fantasy- if I don't buy into the world the author is creating, I usually cringe through the rest of the book. But holy world building! I just absolutely love the way that the "Night Circus" is written. Morgenstern makes it look so easy! As I was reading, I didn't even realize what was happening - the world building so immersive but also so subtle. You're just taken on this magical journey through the night circus. I loved the characters in "The Night Circus" as well. Poppet and Widget were favorites, but I especially enjoyed the storyline involving Bailey, a teenage boy who is swept into the circus. One magical day the circus appears in a field near Bailey's home. Bailey is immediately enchanted by the magic of the night circus, and feels a connection with one of the participants, Poppet, for years after the circus leaves. When the circus reappears years later in the same field, Bailey reconnects with Poppet - and their friendship and eventual romance was one of my favorite storylines in the book. Bailey is unlike anyone else in the circus, he isn't "magical" in any way and that contrast was enjoyable to read and provided a wonderful balance to the fantasy of the circus. My biggest sticking point with "The Night Circus" was the ending. I don't want to fill this review with spoilers, but the ending had a lot of fantasy. The kind I'm not particularly fond of, because it felt kind of cheap. The characters in the book seem to have gotten themselves into an impossible situation, and when "magic" also solves all of that... just not the way I prefer for stories to be resolved. While reading "The Night Circus", I kept waiting for that moment when I understood why it was so highly praised. Isn't that the hardest part about reading a hyped book? I'm always reading waiting for that ah-ha moment, but it seems like it only really happens about half of the time. And even though that never happened for me, I can certainly understand why this book is so popular and I really enjoyed reading it! What unbelievably popular books have been sitting on your TBR list for years? Let me know in the comments below. 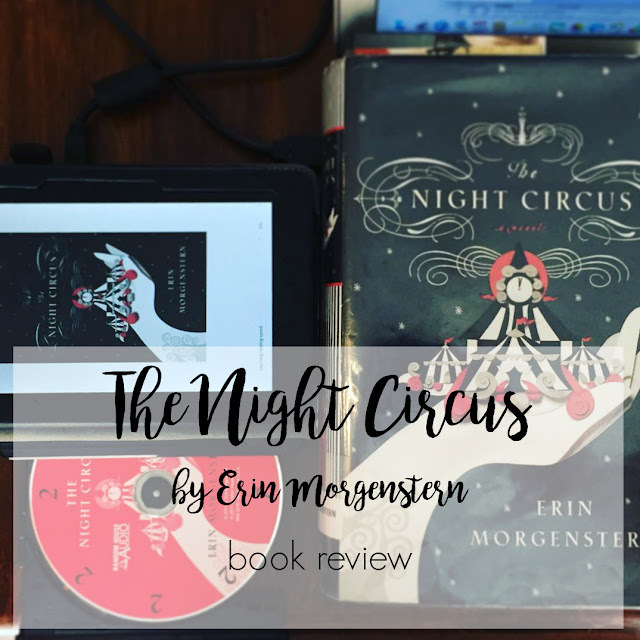 Interested in reading "The Night Circus"? Find a copy at your local library by clicking here or click the image below to view the book on Amazon. Ugh, this book has been on my TBR forever too! I don't even have an excuse. I love fantasy. I love circus. Those are like my two favorite things to read about. And I'm pretty sure the library has the ebook lol. But I just keep putting it off? It does bother me when magic just kind of changes and does exactly what everyone needs it to do and solves everything at the end of a book, but if the rest of the book is good, I can still enjoy the book overall. I'm glad you liked this one! I'll will HAVE to finally read it next year lol. Oh yeah, I can totally relate to a great book being lost in the TBR stack! Seriously, I have NO idea why I have not read this one yet. Fantasy is one of my favorite genres, and I have yet to read a bad review about this book. I just read this last year (listened actually) and really enjoyed it. I am not sure i had the ah-ha moment but I understand the hype. Great review!